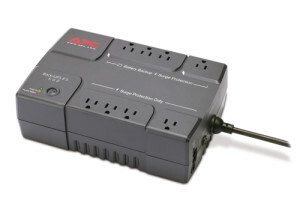 You are here: Home / technology / Surge Protectors: Are your computer systems fully protected? It’s summer here along the coast of Maine. As a Mainer, I love the longer stretches of daylight that summer brings, taking the family to the beach and getting “upta camp” on the weekends. In the midst of all the summer relaxation though, the higher temps & humidity increase the chances for severe weather. Even as I write this article, I can hear the familiar sound of a thunderstorm warning on the radio. Though severe weather and unstable electrical currents may be greater this time of year, it’s important to have adequate protection year-round. Whether it’s a desktop, laptop, network server, cable modem or a router, you need to make sure your computer systems are fully protected against power inconsistencies. Even if your computer and network equipment are plugged into surge protectors, unfortunately, it’s not enough. Don’t get me wrong, surge protectors have their place but if that is all you are using to protect yourself and your business, I encourage you to read on. Blackouts occur when the power completely shuts off without warning. This could be region wide (due to a storm or transformer issue) as well as localized (maybe you have too much plugged into one outlet). Brownouts are caused by a decrease in voltage to your computer systems. This can happen for a number of reasons, but most commonly when nearby heavy equipment is turned on and demands greater voltage to get started. A perfect example of this might be your air conditioner. Ever notice how the lights and computer dim or flicker when it kicks on? Power Surges happen when power spikes or surges through the circuits for any number of reasons. Lightning Strikes send an incredible amount of electricity through and have proven to be detrimental to electronics and household appliances alike. Surge protectors were first created to help stop electrical currents from surging through the wiring that powers your electronics. 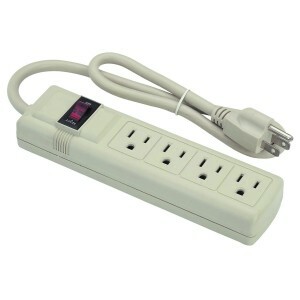 (It’s important to point out that surge protectors are different than simple power strips that offer no protection. Be sure to read the packaging carefully when purchasing!) However, over the years they have given users a false sense of security. In the event of a lightning strike, surge protectors can fail as they may not stop the incredibly high voltage racing through the wiring. Needless to say, that’s bad news for computers, servers and data communications equipment everywhere! The electricity that flows into our homes and businesses is not always steady. There is a natural “ebb and flow”. If the voltage spikes for any reason, surge protectors are designed to stop that surge from reaching your hardware and causing damage. However, as I mentioned in the paragraph above, they typically may not stop the massive spike in voltage caused by a lightening strike. One of the most common bits of advice I hear when discussing what to do in a thunderstorm is to unplug your computer. This method of protection is infallible and will protect your computer systems 100%. However oftentimes this advice isn’t practical, because you won’t always be next to your equipment when a storm strikes. or your systems are such that they MUST be up and running at all times to keep business going. Uninterruptible Power Supplies have proven to offer better protection to your electronic devices than surge protectors alone. A UPS device smooths out noisy power sources and provides consistent power during sags and spikes. These heavy duty devices (also called “battery backups”) provide not only greater surge protection but can deliver battery power to your devices for up an hour, depending on the model. Why is this important? When a computer is shut down in a normal fashion, there is a sequence of events that are happening “behind the scenes”. Programs are shutting down, files are closing, etc., etc. If this sequence of events does not occur properly because of a sudden power outage, the chances of hard drive corruption increases significantly. Picture that excel spreadsheet you’ve been working on for months, gone in the blink of an eye! Over time if this type of shutting down improperly continues, it reduces the life span of your computer hard drive and network equipment. Implementing battery backups on your systems is crucial for the best protection possible. Though we cannot guarantee that a high powered jolt of lightning won’t also bypass the battery backup as it would surge protectors, we can tell you that your chances are much better. Also, be sure not to overlook mission-critical network equipment such as cable modems and routers. Losing any device that makes up your network is normally bad business. Even with all of these precautions in protecting computers and networks from power threats, nothing is 100% . If you have known us for any amount of time, you know that we are always advocating for reliable backup systems. 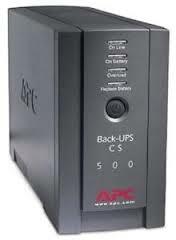 A reliable backup system is one that you a.) know is running on a regular basis b.) is backup up ALL the files and folders you would need in the event of a crisis c.) is tested on a regular basis. Please don’t say to us that your backup is on a thumb drive sitting on the dashboard of your car. It makes us cringe. Please do look into a cloud based online backup solution, as this is by far the easiest to monitor and restore from when its needed. As wonderful as modern day electricity is, it is necessary to take steps to protect mission critical computers, network equipment & data communications equipment. Using the UPS devices explained here will help you relax the next time you are out on the golf course and hear a rumble of thunder. Okay, maybe not quite. But at least you wouldn’t have to worry whether or not your computers are protected as you scramble back to the club house!